It's no secret that Instagram can be a very powerful marketing tool. Use it right, and it can help you grow your brand and tap into entirely new audiences. But like any promo tool, getting the best from Instagram can be tricky. Someone who has well and truly mastered the platform is Dot Lung, the self-styled 'Mother of Social Media Dragons'. 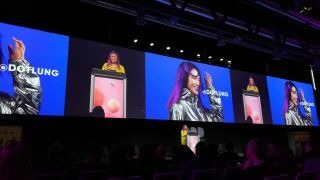 Yesterday, she revealed her fail-safe formula for gaining and retaining followers to a packed room at Digital Design Days, and we caught up with her afterwards to find out a bit more. Here are five hot tips for hacking the Instagram algorithm. Rule one is: create a dialogue. "Social media is not a one-way street; it's a two-way tango," says Lung. Instagram shouldn't just be you putting out content and forgetting about it. Read your comments and start conversations with your followers. The more people speak to you, the more you'll grow your reach. If you're a brand, you're probably going to need to make announcements from time to time, but make sure you balance this with conversations. Make sure your followers are getting something back. To help with this, it's time to get opinionated. Figure out what your brand stands for and let people know; opinions help open up a dialogue. While what will resonate most with your audience will of course vary hugely from group to group, there are some universal human emotions that the internet loves. "One of them is humour. If you can make them laugh, it's automatically shareable," says Lung. "If you can make them say, 'Oh my god, me too', that has the possibility to be viral." Further to that, use what you know about your audience to tailor your feed to what will make them tick. The key thing with Instagram is that what you put out genuinely reflects your brand personality. Real and organic wins out over perfect and packaged every time, says Lung. This might require a bit of a mental shift, given that crafting the perfect image is something that companies have historically invested an awful lot of time and effort into. She goes on to qualify her earlier statement a little. "Research shows that millenials trust brands that are authentic. So that might be raw and real, or you might be authentically polished and prim – that's okay too." The message is to find your authentic voice, and be consistent in your messaging. Keeping things consistent is key to brokering that trust with your audience. Remember: Your vibe attracts your tribe. If you push out a fake persona, you're not going to attract genuine followers. On Instagram, the more curated your content is, the better. Don't believe us? Take a look at House of Magazines, which curates content from super-niche Instagram communities. Whether you're into cacti, David Bowie, or the colour yellow, there's a dedicated magazine on here for you. The follower numbers are testament to just how popular very specific channels can be. So how do you find your niche? "What is your true passion? What are you so hot and crazy about, and would geek out to... figure out what you don't mind spending hours and hours looking at and thinking about," suggests lung. "You have to be obsessed. I mean... you don't have to, but it's easier if you are." There's a bunch of tools to help you create slick content and ensure your posts jump out in someone's feed. As well as the hugely popular VSCO filters ("everyone has them"), Lung picks out Unfold as the hottest tool right now. Use it to create professional-looking Stories quickly. CutStory is another favourite – used for chopping your videos into 15-second chunks – but Instagram has recently rolled out a feature that does this automatically. "I still like to use it because you don't always need to post everything," Lung adds. To make your Stories creative, Lung suggests exploring the features within the app itself. "It's crazy – there are so many features and so much stuff you can do with Stories." For all the latest news from Digital Design Days, follow us on Twitter.